​An iFlow Production Original - In light-hearted comedic series we discover what it takes for an American to be married to a Ukraine women. How they navigate through married life, the language barrier, expectations and cultural differences. Starring: Tanya Quenko, Brady Scott Holden and Tommy Tomahawk. Episode 1: Honey - When you can't understand your wife who do you call? An accent reduction teacher. Episode 2: Would you love me if....? - Be careful what you ask for, you may not like the answer. Episode 3: How I got my Ukraine Wife - It's very hard to get one but even harder to get rid of them. ​A iFlow Production Series, in association with Entitled Angels Entertainment, LLC - Carol is a 50+ actress in Los Angeles and all her and friends want to do is act and book a regular TV series gig. Not much to ask for right? Instead she's desperate for money and a job and takes a Voice & Speech teaching job at Valley Girl Talent Inc. How hard can it be? Lesson one in the industry - you don't need to be a brilliant at acting, you just need to be on time. Carol endures a lecture on customer service just so she can get paid. Meanwhile some of her students pop out for a quick session. Working at Valley Girl Talent Inc has it's challenges. The staff are interesting characters and for Carol it's hard enough trying to go to the toilet. Then there's 'The Weed People'. Episode 4: What Am I Doing Here? This is not what Carol signed up for. All she wants is to be is an Actress, instead she's dealing with international students who lack the commitment to learning the craft unlike her Yale Alumni. What has she got herself into? Not only does Carol have to teach Voice & Speech she must help these international students speak with a Standard American Accent. Easy right? Every actor needs to learn theater, every actor needs to learn Chekov. Now its audition time. ​Taste of Tuscany is a dramedy about an Italian teenager and his friends and the lengths they will go to for their loyalty to family and friendship. People all over the world flock to Los Angeles to chase their Hollywood dream of becoming a successful and famous actor. This is where you make it or break. Take a journey with a number of M1 Visa Non-immigrants who come travel from all corners of the world and realize its not as simple as they thought and it's not just being a actor either its also navigating the life in Los Angeles. It's hard to be a Director and it's harder when the only person doing her job efficiently and quietly is the sound girl. Its bad enough you have a millennial who doesn't know her place and lacks work ethics and undermines authority. On top of that your star is stinking drunk and no matter what comes out of your DPs mouth you can't understand a word she is saying. Is this really Hollywood? *Pricing by agreement and dependent on budget. "Bernice Breckon Triple Threat" - Taste of Tuscany. 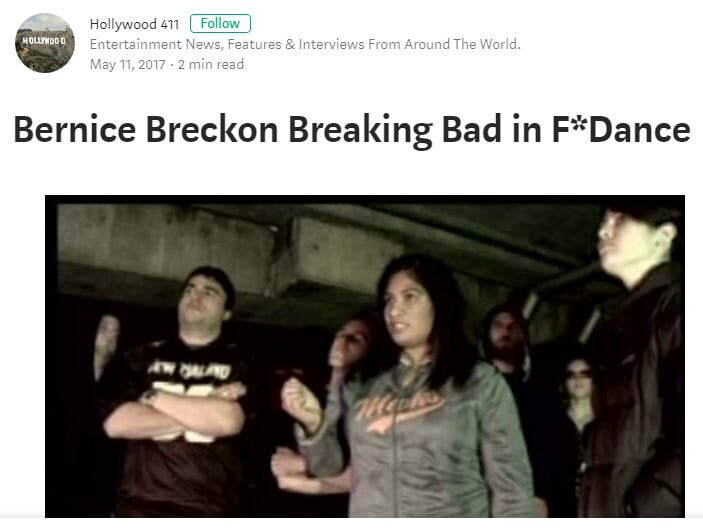 "Bernice Breckon Breaking Bad in F*Dance"
​In this Acting Intensive Training class we touch on the different acting techniques to help discover what works for you. Be introduced briefly to Script Analysis and the importance of breaking down a script to understand your character and their place in the story. How each scene drives the story forward and learn a characters arc or place in the story. This allows for the actor to choice objectives, obstacles, stakes, conflicts and actions for a more powerful and engaging performance. 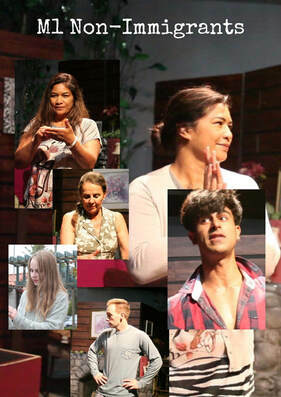 Scene study allows students to put into practice what they have learnt during which time we will touch on physicality, emotion, voice and dialogue emphasis. If you are beginning in the industry in this class you will learn how to work in front of a camera and put your best foot forward during an audition. Understand the sides you've been given, what is the scene about or what is the genre, where to place emphasis and making choices that make your audition performance pop and be memorable. We cater for those actors who've had some training or are well seasoned actors who just want to exercise their actor muscles. In this workshop we look at the structure of a script from the writers perspective to understand the story in terms of theme, style, tone, plot and sequences. Then we can apply more dynamic objectives, actions, secrets and obstacles to our character roles and discovering those gold nuggets in a script.​ It is important to break down a script to understand your character and their place in the story. It is encouraged that the actor explores the writers perspective of the character as it is written before creating a backstory to ensure it correlates to essence of the story and character. Bernice started iFlow Productions in Sydney, Australia in 2014 before moving to Los Angeles in 2017 and starting a branch here. We are excited for iFlow's future. We are exceptionally proud to have Tanya on-board Team iFlow. Tanya brings her industry knowledge and marketing skills to help bring iFlow to the next level.